Hand crafted around 1870, a country pine jelly cupboard has locking doors to protect the fall harvest jam and jelly from hungry children. The finish is very good with stains and mars for character. It has been waxed and buffed so only an occasional wipe with a soft dry cloth is needed to maintain its warm antique patina. This rustic American made kitchen furniture has various restorations, repairs and a later back panel, see photos. Doors have wooden pegs securing chamfered panels. 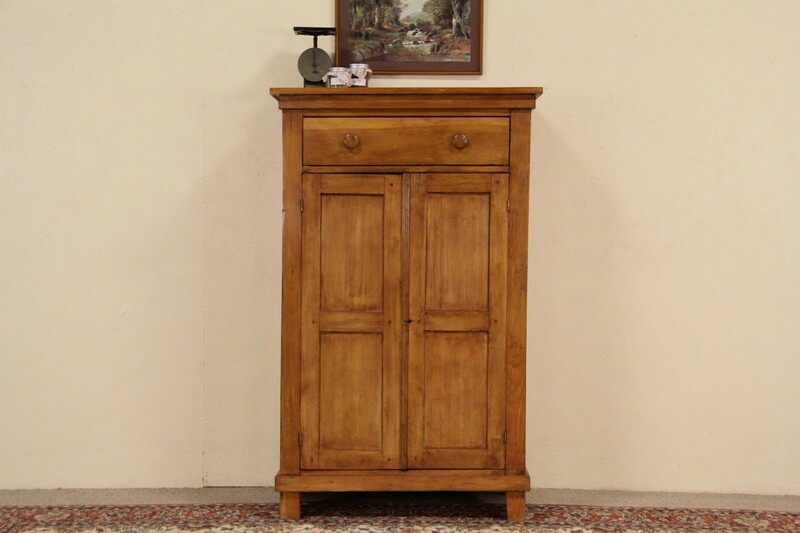 Square cut nails are visible on this picturesque cabinet, it has warps and is charmingly uneven everywhere. Measurements are 38 1/2" wide, 20" deep and 61 1/2" tall.